Defy Epoxy Wood Stain highlights the natural grain in 3 different tints. It is currently offered in 1 or 5 gallon containers. Coverage rates vary from 100-150 square feet per gallon based on wood texture, age and porosity. 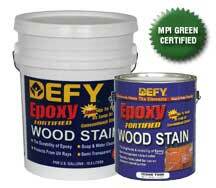 Please write a review of your experience with Defy Epoxy Stain or ask a question in the comment area below.